This is the first game in the Borderlands series. 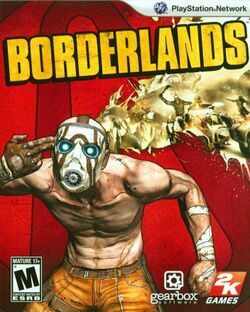 For other games in the series see the Borderlands category. Borderlands is a science fiction first-person shooter with RPG elements that was developed by Gearbox Software for Microsoft Windows, Xbox 360 and PlayStation 3. The console versions of the game were released in North America on October 20, 2009 and in PAL countries on October 23. The Windows version followed on October 26 for North America and October 30 for the rest of the world. The game was first revealed in the September 2007 issue of Game Informer magazine. In the distant future, several colonization ships journey to Pandora, a planet on the edge of the galaxy. The colonists are drawn to the planet in search of a better life and the prospect of striking it rich by claiming the vast deposits of mineral resources rumored to be there. After finally arriving, the colonists discover that the planet is barren of anything of significant value other than deteriorated alien ruins scattered across the land. Those who can afford to do so leave Pandora, and those who remain revolve around chaos and lawlessness. Some of the settlers seek to get rich quick by discovering alien technology, but most others are just trying to survive. After seven Earth years, Pandora's orbit brings it to the transition from winter to spring, and many horrifying creatures emerge from hibernation. A beacon of hope for the remaining colonists emerges in the form of a mysterious vault carved in the side of a mountain. This vault is said to contain vast stores of alien technology and secrets. However, the people who discovered the vault were completely wiped out by some sort of protective force, and the only evidence of their discovery is a scattered radio transmission proclaiming the vault's majesty, but not its location. This page was last edited on 16 August 2016, at 16:12.